Dr. Marchand is Professor of Strategy Execution and Information Management at IMD International, one of Europe's leading business schools, based in Lausanne, Switzerland. From 1997 to 2000 he was the director of the research project, Navigating Business Success that discovered the Information Orientation (IO) metric. Dr. Marchand teaches how this new metric can be used to boost bottom line performance through effective information, people and IT capabilities in many of IMD's programs. Internet strategy for established companies. 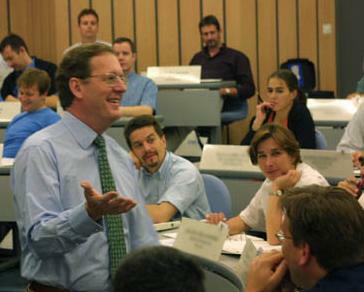 Professor, International Institute for Management Development (IMD), Lausanne, Switzerland, July 1, 1994-present. Visiting Professor, International Institute for Management Development (IMD), Lausanne, Switzerland, July, 1990-June 30, 1994. Associate Professor, Department of Management Science, College of Business Administration, University of South Carolina, July 1, 1982-June 30, 1987. Associate Professor, Department of Government and International Studies, University of South Carolina, August 1, 1980-June 30, 1982. Assistant Professor, Department of Government and International Studies, University of South Carolina, 1976-1980. Instructor, Department of Government and International Studies, University of South Carolina, 1975.